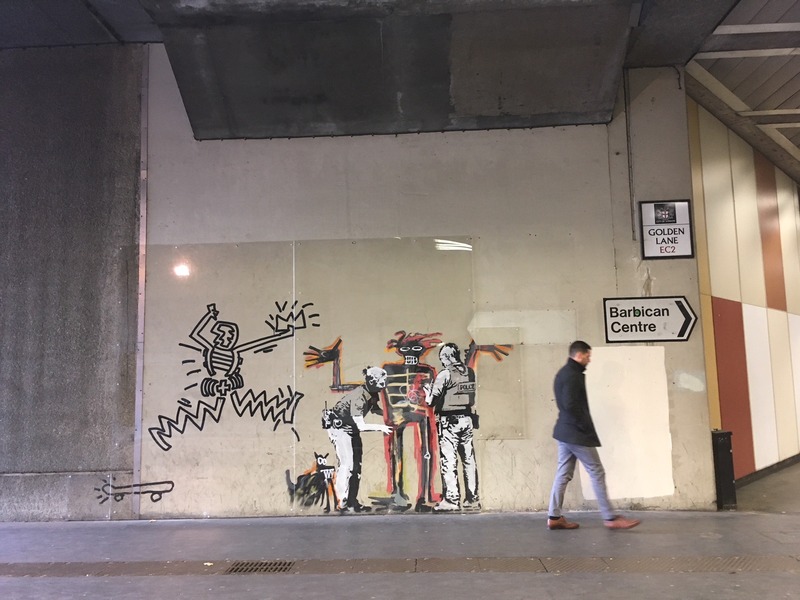 The team at the Barbican Centre have decided to permanently protect valuable works by Banksy which were created last September as a tribute to Basquiat. Valuable works by graffiti artist Banksy will be preserved on the walls of a City exhibition centre. The internationally-celebrated artist, whose work fetches six-figure sums at auction, paid a clandestine visit to the Square Mile just before the opening of the Barbican’s Basquiat: Boom for Real exhibition last year. He created two works overnight in homage to the pioneering New York artist Jean-Michel Basquiat, and took the Barbican management team by surprise. The exhibition proved to be the most successful in 35 years of art shows at the Barbican, with 216,389 people visiting it. Many also admired Banksy’s works, and the exhibition benefitted from the added publicity. The first piece used a character from Basquiat’s own work and showed the New Yorker being searched by police. 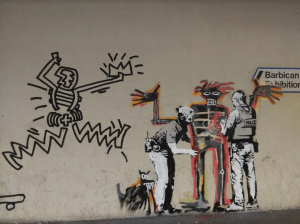 Banksy attributed the work via his own Instagram account and captioned it ‘Portrait of Basquiat being welcomed by the Metropolitan Police’. The second shows five people waiting for a ferris wheel and uses the symbol of the three-pointed crown, which Basquiat often used in his own work. US artist Danny Minnick subsequently added his own work to the homage. The Barbican Centre Board has now agreed to a long-term strategy to protect the street-level paintings having swiftly arranged security during the exhibition. There were initial concerns the City of London’s cleaning team might remove them. Other artists have since ‘tagged’ the work, but these have been removed by the Barbican. The two pieces attracted 296,000 likes and 2,000 comments on Banksy’s official Instagram account. Last month, Banksy’s Canvas of Girl With a Balloon self-destructed to the consternation of the art world after it fetched £1million at auction. 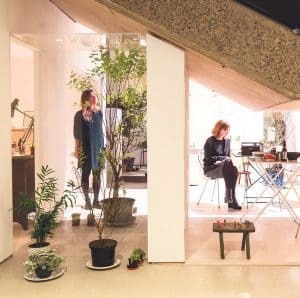 Jonathon Poyner, the Barbican’s director of operations and buildings, told the board the cost of a protective Perspex covering was in the “minor hundreds”. Councillor Vivienne Littlechild (Cripplegate) said she was aware of a round robin letter complaining about people collecting on the pavement and making noise as they looked at the art. Dr Shilson said he received one complaint “from somebody who said it was grotesque”. 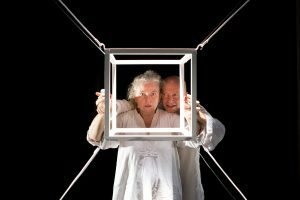 He added that, like the attention when Benedict Cumberbatch appeared in Hamlet at the Barbican, the “initial flurry of interest” calmed down. The board approved the Barbican Centre’s work to preserve the paintings and meet any costs from their budget.